The Orlando MQG is organizing the #QuiltsForPulse movement to support the victims and their familes of the Orlando shooting by making quilts. We would like to make a quilt as a guild to send down to Florida to help in the effort. The plan is to make a lap sized quilt out of 12" x 12" (finished) heart blocks. The quilt will contain 30 blocks in a 5 x 6 block arrangement making a 60" x 72" quilt. The 12" x 12" (finished) blocks should contain red hearts on a low volume background. The red fabrics can be any solid or print and the low volume prints should be mostly white with a small black and white (or colored print) print. From a distance the low volume prints should read as a white or cream color. Blocks will be due at the July meeting (9th). The quilt will be finished and shown at the September (10th) meeting and then mailed off to Orlando. If we do not get enough of a response, we will collect the blocks people have made at the July meeting and mail the blocks off to Orlando. 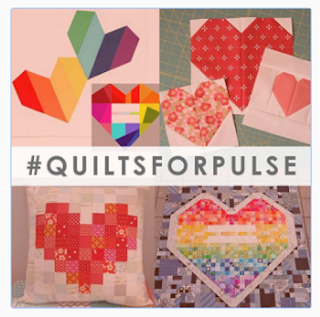 We will using SignUpGenius to keep track of all of the donated blocks and volunteers to get the quilt made. SignUpGenius is a free way of signing up for items (you do have to register but it is totally free). If you would like to support the effort but do not feel comfortable entering it into SignUpGenius, simply leave a comment below on what you would like to donate/do and we will enter it into the system.